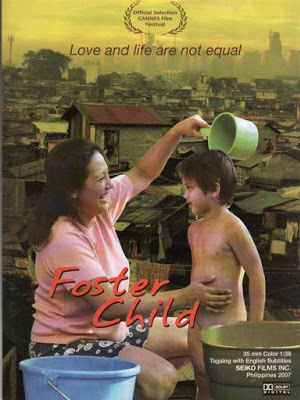 Thelma, together with her husband Dado and teenage sons Gerald and Yuri, are an urban poor family hired by a local foster care facility to provide temporary home and care to abandoned babies pending the latter's formal adoption. The inevitable separation is heart-rending for the foster family. Thelma's foster child John-John is to be turned over to his adoptive American parents. Every moment with the 3-year-old John-John becomes more precious as Thelma goes through the day fulfilling her motherly duties for the last time—bathing John-John, feeding him, and bringing him to school where the boy participates in a school presentation. Cast: Cherry Pie Picache, Kier Segundo, Eugene Domingo , Kristoffer King, Jake Macapagal, Ella Antonio, Paul Holmes, Lili Arivara, Ermie Concepcion, Jiro Manio.